This kit contains two motorcycles originally offered in MiniArt's excellent U.S. Motorcycle WLA along with two MP figures. The small sprue with the figure parts includes a new pair of saddle bags so both motorcycles don't look unrealistically identical if you pair them together in a diorama, a very nice touch by MiniArt. Also, there is an additional bundle of gear as seen in the cover art. The figures are sculpted and molded with the typical eye for detail MiniArt has demonstrated. The soldiers wear uniforms suited for warm weather. With one in canvas leggings and the other wearing the two-buckle gaiters, it's realistic to pose both of them together in the late summer or early fall of 1944, but the leggings pretty much disappeared as the war dragged on into the winter of 1944-1945. Decals are provided for the motorcycles and the MP insignia. The registration was a wee bit off for the instrument dials but the others were spot on. 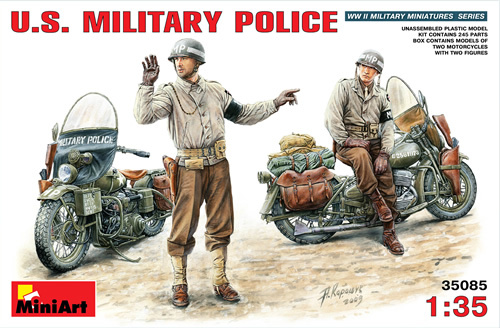 This is another top-notch kit from one the hobby's best resources for U.S. WWII figures. Review sample provided by MiniArt.